Before we made the official switch to organic chicken, I did some price checking. Being a good steward includes spending your money well, and making it money well spent. Since Costco and Trader Joe’s are two of the stores I shop at most, my research primarily ends there. I can check the prices at Whole Foods when my stash of pepitas needs to be restocked, but in general, Whole Foods tends to be pricey anyway. It’s doubtful that organic chicken is an exception to that rule. Clearly, Costco has the best prices. A side note though, if you’re looking for dark meat and don’t have a preference to drumstick or thigh, the drumsticks are a good deal at TJ. That’s fairly close to the going rate for conventional chicken legs. The variety pack is also a decent deal if you’re not particular on the cut of chicken. There were a few chicken dishes planned for this month and at least two required chicken breasts. But as ya’ll have seen from my shopping trips, I didn’t buy chicken breast. Instead I chose to buy two whole chickens, with a plan. A plan to chop them up raw so that in the end I had my chicken breasts, but I also had chicken legs for crispy baked chicken, and bones for homemade stock. What happened though when I actually cut up the chicken was entirely different – I ended up with MORE meat than I originally thought I would. Today’s post is the first half of how to make the most of your money by buying a whole chicken and cutting it into parts – while it’s raw. When each chicken costs more than $10, every ounce of the bird needs to be stretched as far as it can. 1. Wash your hands and rinse the bird well with water. Don’t be afraid to get all chicken-goo-ified. You can wash your hands when you’re done too. Remove the innards and set aside for stock. 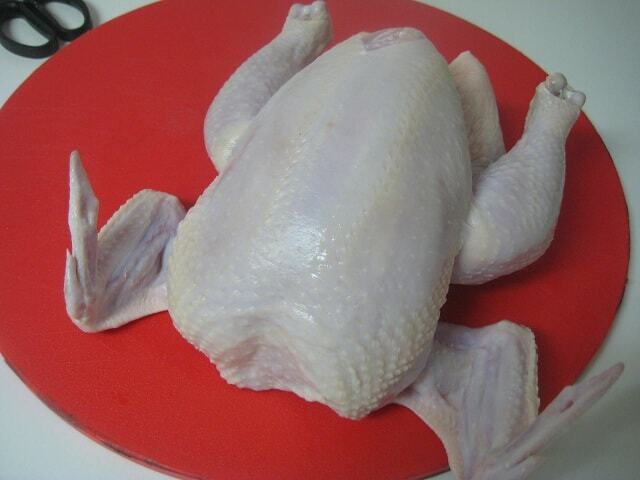 Dry well and set your bird on a cutting board. 2. Familiarize yourself with the bird. Shake it’s hand, er, wing. Notice the breasts are on the opposite side of the leg. 3. At this point it’s easiest to remove the skin before you start chopping. This makes it MUCH easier to see where the muscles start and end and will make the most of your hacking extravaganza. Set the skin aside for stock. 4. Start with the legs first. You can see where the legs are attached to the body, but the muscles on the leg are clearly visible. While it’s tempting to oh-so-gently carve around the chicken leg from the top, that’s not the route you want to go. 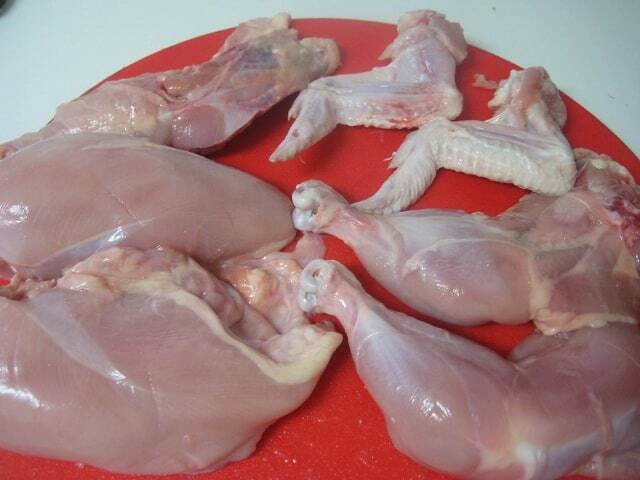 Cutting around will give you disfigured chicken parts and in the end, wasted meat. 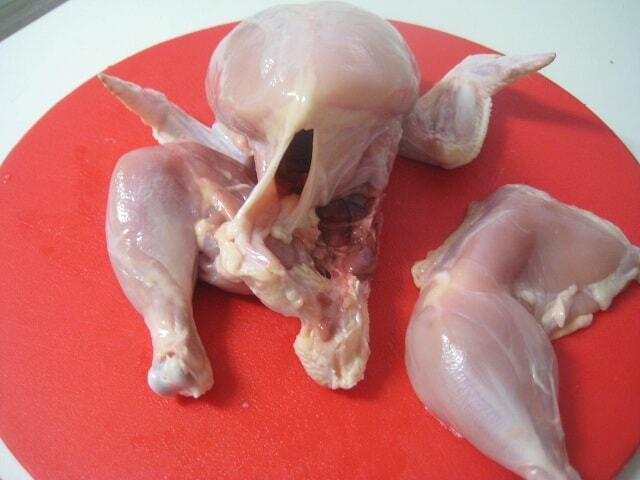 Flip the bird over and spread it’s legs. 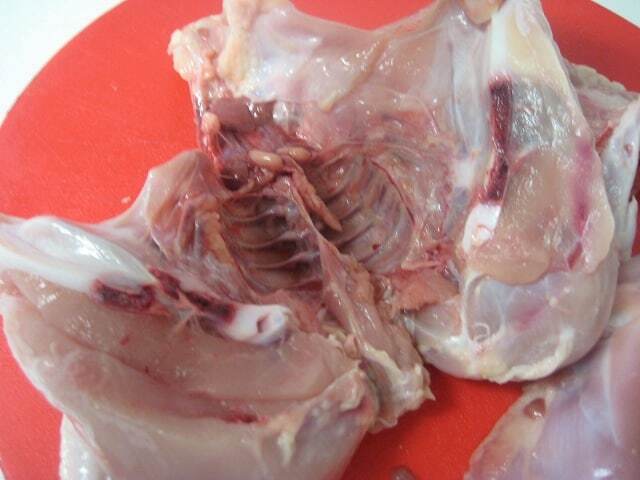 If this is your first time, I recommend using your fingers and hands to feel around the legs to get an idea as to where the bones and joints are. You are going to cut through them. Holding your knife at a slight angle towards the chicken body, apply pressure down and firmly through the joint where the leg is attached. Do not try to “saw” the leg off. Push down firmly with all the strength you have (unless you’re She-Ra, then don’t use ALL your strength). Do not be afraid of cutting too close to the body. It is better to have extra meat on the legs (which can be cut off later) than to leave leg meat on the body (which is then lost to the crockpot). 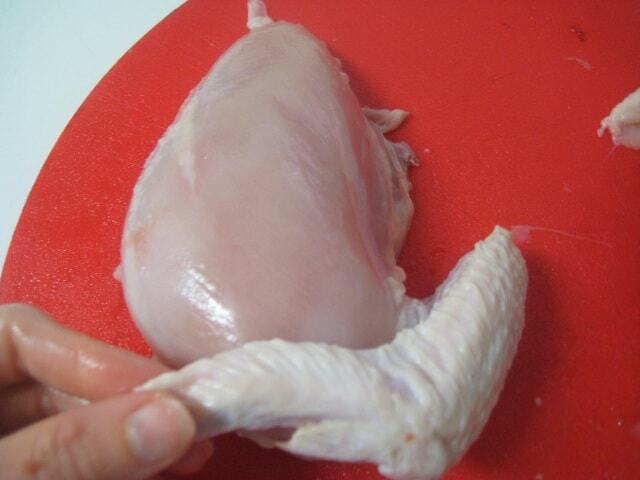 Repeat the same step for the other side, holding the knife at a slight angle towards the body of the chicken. You can see there where my second cut wasn’t as clean. It may be hard to see, but I left a bit of the leg on the body. Granted, not the end of the world, but I am trying to make the most of the chicken, right? 5. Next up – cutting the chicken in half. Flip your bird around so the wings are up front. 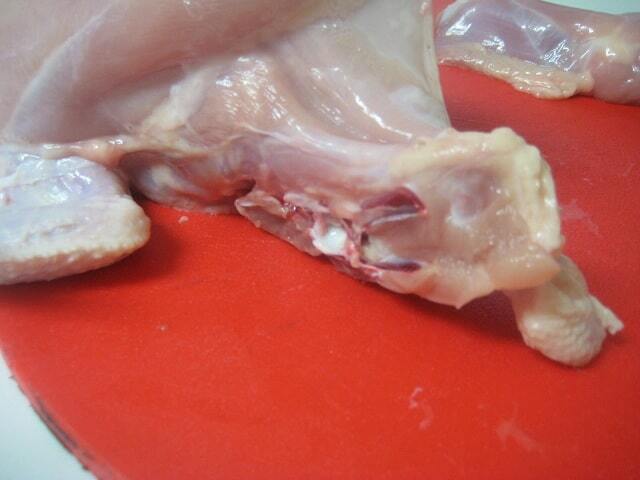 Start cutting the chicken down the center of the spine by pressing down while using a slight sawing motion. You will cut through breast meat first before you get to the spine. Your cut doesn’t have to be perfect (and probably won’t), but you want to stay as close to the middle as possible so you end up with two even-sized breasts. You may have to press hard when you get to the bone. 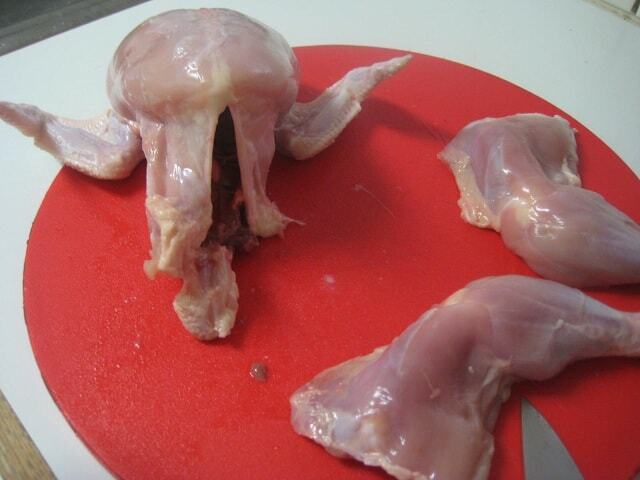 Once you’re through the spine, your chicken will open up like this. See the spine and the various muscles attached to it? We’re cutting around those next. 6. 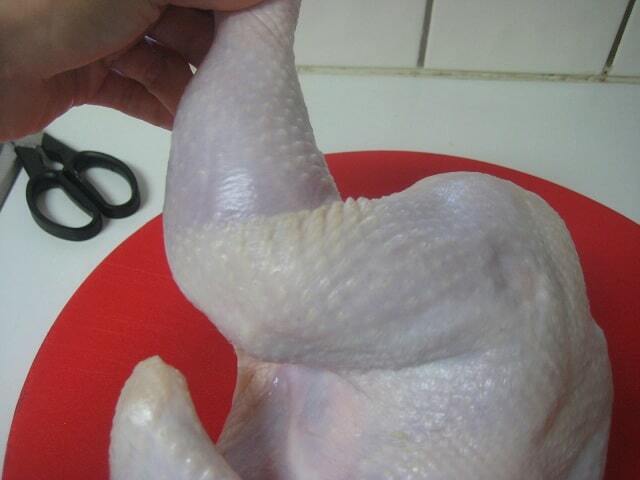 We can cut from either side of the bird to remove the breasts, but I thought placing the bird inside out was easier. 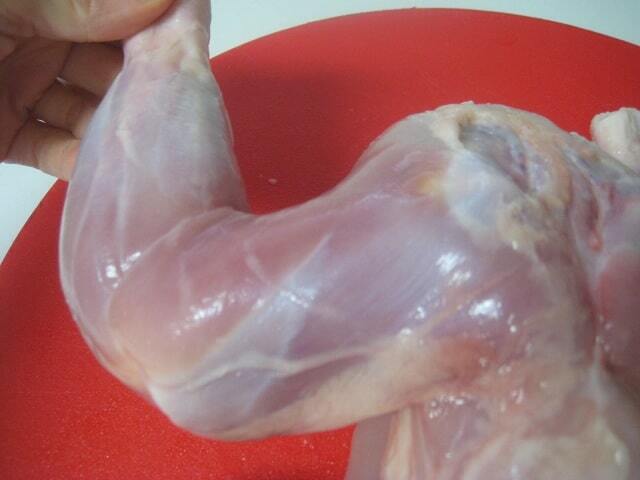 Carefully cut away the breast/wing combination from the spine muscles of the chicken. Use the same technique we’ve been using – angle towards the center, aiming to keep as much breast meat on the breast as possible. Remember that it is best to have cut off too much spine that not cut off enough breast. Repeat this for both sides and you should have two breasts with wings attached. 7. Removing the wings is duplicate of removing the legs. Feel around for the bones, angle your knife and press hard. Remember not to saw here, just press firmly. These bones aren’t as strong as the leg bones though, so She-Ra strength is overkill. Just use your best new-jar-opening muscles. 8. You’re done! At this point you can lay out your chicken and admire your handiwork. 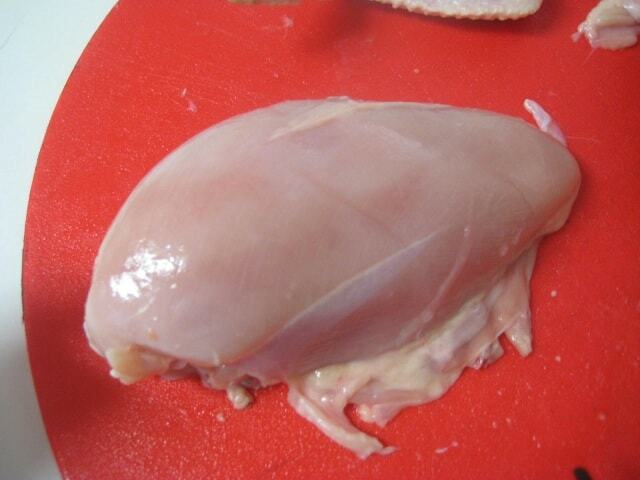 Before serving your breasts, verify that you have indeed cut out all of the bones. Sometimes a rib can get stuck in there, or an extra tough tendon. Now is the time to remove those if necessary. This is a great tutorial. I’m sure I’ll be referring back to it. Thanks! We sent my husband to a cooking class and he learned how to do this. My favorite part is how they termed it.. DH can now “take down” a chicken. It makes me think of SWAT teams… a very manly way of cooking. LOL – love that term! I have done many things to a chicken along the course of preparing one to cook. That being said, I never introduced myself to it. I shall now shake their wing as a matter of courtesy. 😉 Great tutorial. This was very well written and the pictures are spot on. Perfect! Thank you. Love the tutorial and the pics! Thanks for sharing! I usually have a big ole mess when I do this! Oh dear, there’s a big mess in my kitchen too!! I am much older than you, so I learned how to do this years ago, but I have to say this is the most detailed, easy to understand tutorial I have ever seen anywhere. There are millions of women who could benefit from this post. Just wanted to say, I noticed that Boneless,Skinless chicken breasts go sale $1.99 lb regularly in my area (California) and bone-in chicken breasts 0.99 lb,typically never buy chicken at Costco, it’s much more expensive there. Thanks Miriam! That’s an amazing price for organic chicken – where are you finding this deal? I always buy organic or pasture raised meat too. 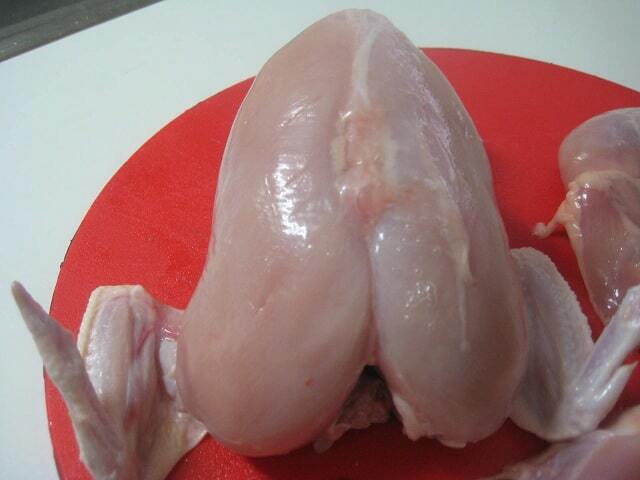 I have never carved a raw chicken like this, but your tutorial is excellent. I have bought whole chickens for quite a while now, but sometimes I put off cutting up the chicken into parts because I am lazy :0) If I don’t need specific parts, sometimes I will just cut the chicken in half. I try to cut down the middle of the breastbone, and then I use kitchen scissors and cut out the back bone. 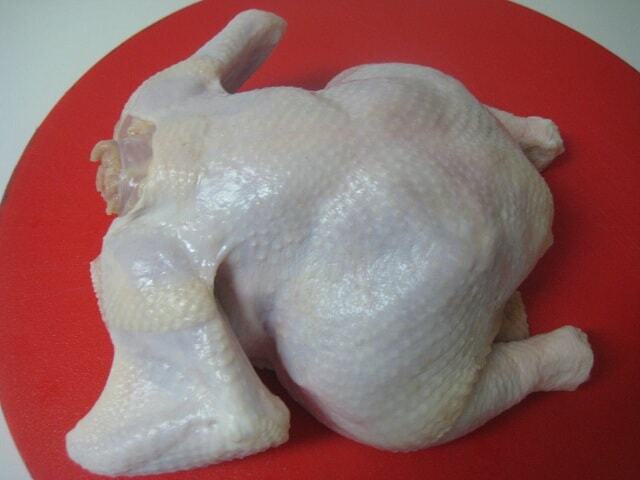 Then you have two chicken halves you can roast instead of roasting a whole chicken. You can still use the bones skin and everything for stock or whatever. Sometimes I like to render the chicken skin to make chicken fat for cooking, too. I came across this how-to on Pinterest and it was exactly what I was looking for! Thank you so much for the detailed step-by-step instructions! This is EXACTLY what I was looking for! So glad I’m a subscriber and it just popped into my inbox! I just bought three chickens the other day to do exactly this. Thanks for the great pics! Hi Tiffany. I would like to say thank you for this tutorial. As I’m a beginner in the whole chicken-cooking-art I find it really helpful and informative. However I just want to point out one thing. 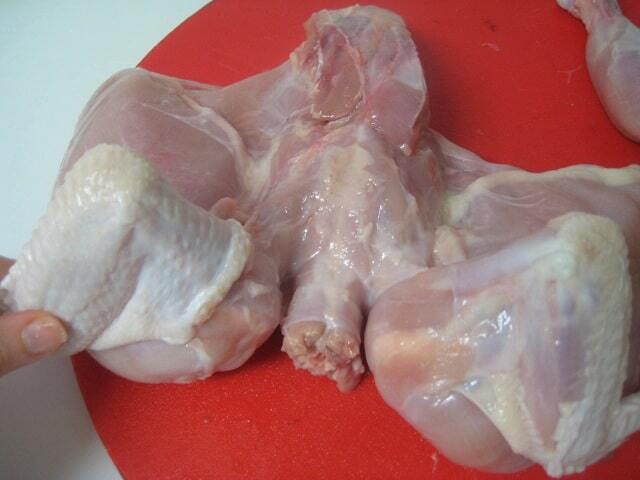 I’m from UK and here we are all advised not to wash chicken before cooking. This is just to avoid meat juices spreading around the kitchen. I am just curious what’s your opinion on that and what’s the general advice on this matter in US?